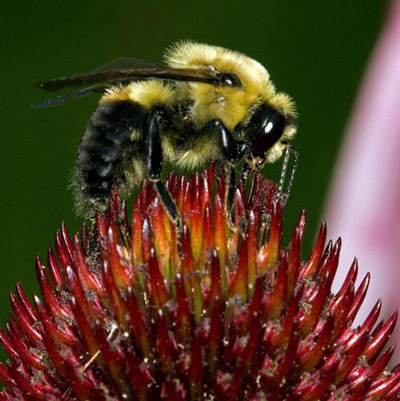 Most bumble bees are large, social bees which produce annual colonies. 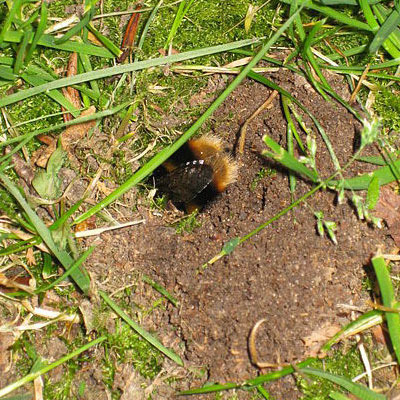 Mated queens overwinter in the soil and emerge from hibernation in early spring when they feed on spring flowers and search for a suitable location, such as a former rodent burrow in the soil, to begin their colonies. These are beneficial insects that pollinate many native and ornamental plants. They can sting severely, so problem nests near human dwellings should be removed by experienced pest control operators. Figure 1. Adult bumble bee, Bombus sp. Photograph by Clemson University; www.insectimages.org. All of the social bumble bee species found in Florida range as far north as Canada (Laverty and Harder 1988). 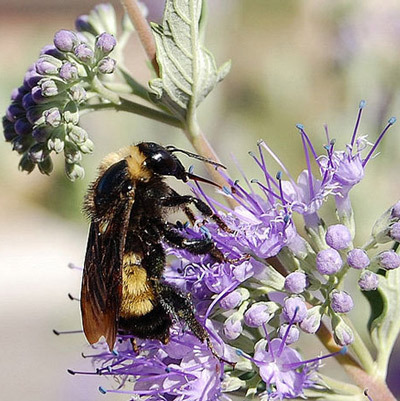 Bumble bees are less common in southern Florida. None are known from the Florida Keys. Two species, Bombus griseocollis and Bombus pensylvanicus, are known from Collier County whereas a third species, Bombus impatiens, has been collected in West Palm County. Bumble bees are easily recognized by the corbicula (pollen basket) on the hind tibiae in the females. Honey bees are the only other bees in Florida with this structure, but are easily recognized by their smaller size, hairy eyes, and lack of hind tibial spurs. 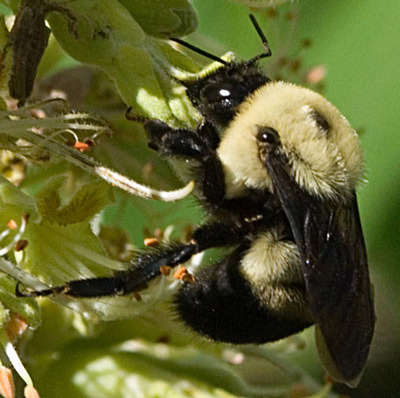 Large carpenter bees are often misidentified as bumble bees, but these are readily distinguished from bumble bees primarily due to the absence of pubescence on the dorsum of the carpenter bee abdomen, which is somewhat glossy. Figure 2. A bumble bee, Bombus sp., with full pollen basket. Photograph by Tony Wills, en.wikipedia.org. The five species of bumble bees found in Florida are usually separated by the pattern of the black and yellow pubescence. 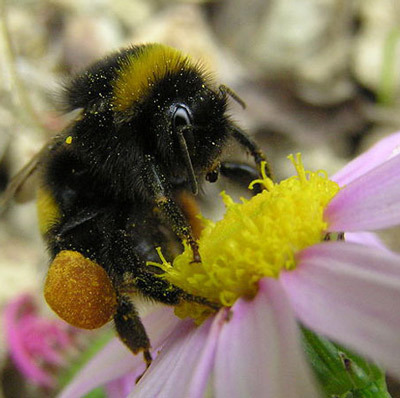 A number of non-social Bombus species lost their social behavior and the ability to collect pollen, and are now cleptoparasites on colonies of pollen-collecting Bombus species. These cleptoparasitic species were previously listed as being in the genus Psithyrus (ITIS 2011), and are now sometimes listed as a sub-genus. The parasitic species are easily distinguished by the lack of the corbicula. The most common of this group found in Florida is Bombus variabilis. Once a nest site is found, the social, bumble bee queen collects pollen and lays her first brood of worker eggs. Workers emerge about 21 days after the eggs are laid and take over the duties of pollen and nectar collection as well as colony defense. The size of the workers increases with each new brood. A third caste of bumble bees, the males, is usually produced in midsummer. Figure 3. A bumble bee emerging backwards from her nest. Photograph by 'Pahazzard,' en.wikipedia.org. Bombus bimaculatus Cresson 1863, the twospotted bumble bee. Its range extends from Ontario to Maine, south to Florida, and west to Illinois, Kansas, Oklahoma and Mississippi. Florida county records include: Alachua, Clay, Franklin, Highlands, Lake, Levy, Marion, Okaloosa, and Orange. Figure 4. Adult female two-spotted bumble bee, Bombus bimaculatus Cresson. Photograph by John Baker, en.wikipedia.org. Bombus fraternus (Smith) 1854, the southern plains bumble bee. Its range extends from New Jersey to Florida, and west to North and South Dakota, Nebraska, Colorado and New Mexico. Florida county records include: Alachua, Franklin, Gadsden, Levy, Liberty, Orange, and St. Johns. Figure 5. Adult female southern plains bumble bee, Bombus fraternus (Smith). Photograph by Johnny N. Dell, www.insectimages.org. Bombus griseocollis (DeGeer) 1773, the brown-belted bumble bee. Its range extends from Quebec and Maine to Florida, and throughout the American West (DL 21011). Florida county records include Alachua, Clay, Collier, Highlands, Marion, and Osceola. Figure 6. Adult female brownbelted bumble bee, Bombus griseocollis (DeGeer). Photograph by Charles Schurch Lewallen. Bombus impatiens Cresson 1863, the common eastern bumble bee. This species is native from Ontario to Maine and south to Florida and was introduced in California and in British Columbia, Canada (EOL 2011). Florida county records include Alachua, Bradford, Calhoun, Escambia, Franklin, Jackson, Gadsden, Highlands, Levy, Liberty, Okaloosa, Orange, Palm Beach, Polk,and Santa Rosa. Figure 7. Adult female common eastern bumble bee, Bombus impatiens Cresson. Photograph by David Cappaert, Michigan State University; www.insectimages.org. Bombus pensylvanicus (DeGeer) 1773, the American bumble bee. Its range extends from Quebec and Ontario, Maryland south to Florida, then west to Minnesota, South Dakota, Nebraska, Colorado, New Mexico and Mexico (Anonymous 2011). Florida county records include: Alachua, Bradford, Collier, Escambia, Flagler, Highlands, Lake, Lee, Levy, Marion, Orange, Putnam, Sarasota, Santa Rosa. Figure 8. Adult female American bumble bee, Bombus pensylvanicus (DeGeer). Photograph by 'Skoch3', Wikipedia. Bombus terricola Kirby 1837, the yellow-banded bumble bee. Originally, this species extended from Nova Scotia to Florida, west to British Columbia, Montana and South Dakota. While once common, its has declined dramatically since 1990 (Anonymous 2011). No specimens seen from Florida, but recorded from Florida by Mitchell (1962). Figure 9. Adult female yellow-banded bumble bee, Bombus terricola Kirby. Photograph by Mardon Erbland. Figure 10. 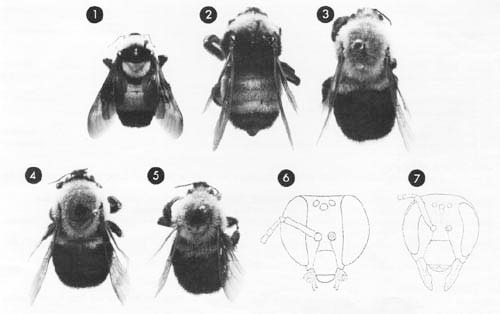 Figures of Florida Bombus spp. 1. Bombus fraternus, 2. Bombus pensylvanicus, 3. Bombus impatiens, 4. Bombus griseocollis, 5. Bombus bimaculatus, 6. Bombus griseocollis, 7. Bombus bimaculatus. Photograph by Division of Plant Industry. Anonymous. (2011). 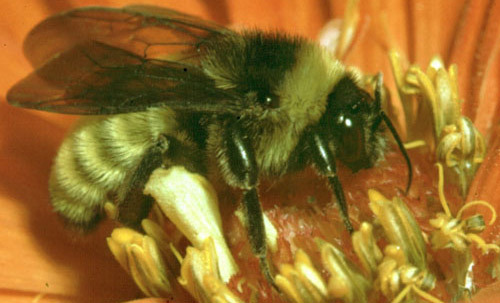 North American bumblebees. Bumblebee.org. (January 2018). DL. (2011). Bombus griseocollis (DeGeer, 1773). Discover Life. (January 2018). EOL. (October 2011). Bombus impatiens, Common Eastern Bumble Bee. Encyclopedia of Life. (January 2018). ITIS. (2011). Psithyrus variabilis (Cresson, 1872). Integrated Taxonomic Information System. (January 2018). Mitchell TB. 1962. 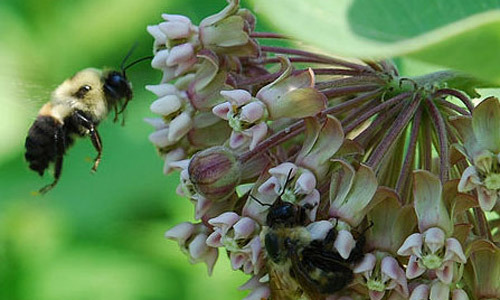 Bees of the Eastern United States. Volume II. Technical Bulletin No. 152, North Carolina Agricultural Experiment Station, pp. 1-557. Laverty TM, Harder LD. 1988. 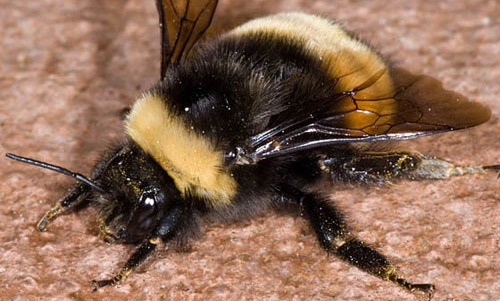 The bumble bees of Eastern Canada. Canadian Entomologist 120: 965-987. Morse DH. 1982. 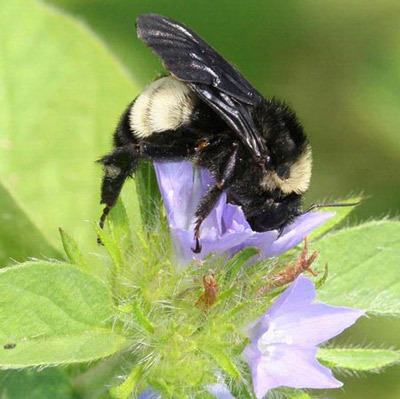 Behavior and ecology of bumble bees, pp. 245-322 . In Hermann, H.R. (Ed.) Social Insects, Vol. 3. Academic Press, New York & London. Authors: Lionel A. Stange, Florida Department of Agriculture and Consumer Services, Division of Plant Industry; and T.R. Fasulo (retired), University of Florida. Originally published as DPI Entomology Circular 353. Revised for this publication . Publication Date: August 1998. Latest revision December 2014. Reviewed January 2018.